Unique modern and sure shot insecticide based on Imidacloprid a chlornicotinyl insecticide(CNI). It is a multiple usage insecticide used to control insect pests of cotton, paddy, sugarcane and vegetables. It is used as foliar spray for the control of sucking and other insects in different crops. 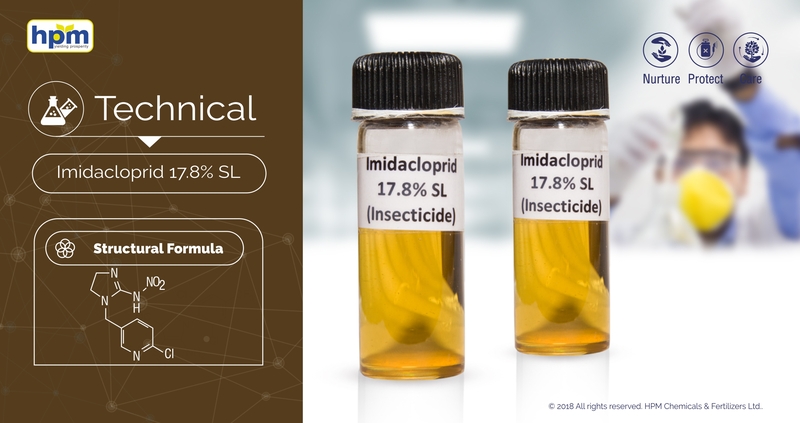 Imidacloprid has a broad spectrum of activity, particularly against sucking insects, various species of beetles, some species of flies and leaf miners. There fields of use are termite and locust control. Its outstanding biological efficacy, especially its excellent root-systemic properties, its broad spectrum of activity, good long lasting effect - combined with low application rates and good plant compatibility, has made the product the first choice of th farmer. It can be applied to plants as a spray or stem paint or as a basal stem spray/drench. It can also be injected into plants or applied as a soil treatment use. 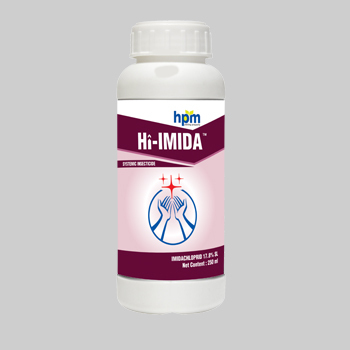 HPM India is one of the best Imidacloprid 17.8 SL manufacturers in India, Contact us now. up by the plant and further distributed acropetally, with good root-systemic action. It is used as foliar spray for the control of sucking and other insects in different crops..
compatibility, has made the product the first choice of the farmer. Incompatible with oxidation materials and acids. Imidacloprid is highly toxic to four bird species: Japanese quail, house sparrow, canary, and pigeon.In bobwhite quail (Colinus virginianus), Imidacloprid was determined to be moderately toxic.Imidacloprid is highly toxic on an acute basis to aquatic invertebrates, harmful to honeybees by direct contact, but no problems expected when sprayed into flowering crop or when used as seed treatment.it is slightly toxic for warms.Imidacloprid is rately toxic and is linked to neurotoxic, reproductive and mutagenic effects. It has been found to be highly toxic to bees and other beneficial insects. It is also toxic to upland game birds, is generally persistent in soils and can leach to groundwater.